Born on November 30, 1937 in Haswell, County Durham, Simpson forged a short but prolific cycling career which included winning the 1965 Road Race World Championship and being the first British rider to wear the Tour de France‘s coveted yellow jersey. Simpson was the youngest of six children. 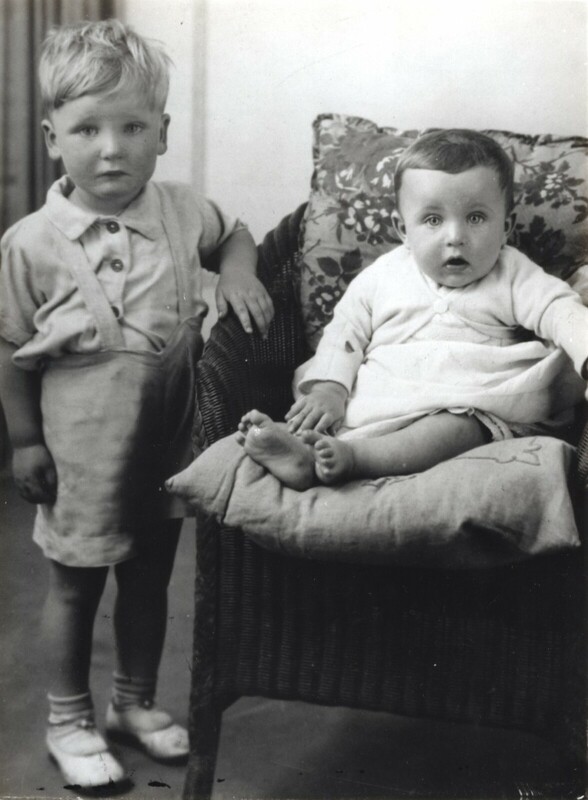 The next in age was his brother Harry, who he is pictured with here in 1938. The two brothers were the only children left at home when the family moved southwards. The family moved to Harworth, Nottinghamshire in 1950. 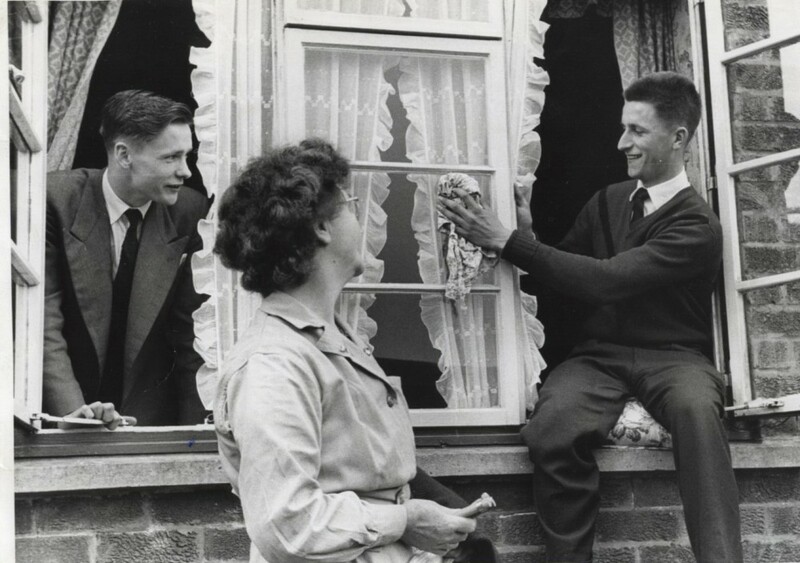 Above, Tom is seen cleaning the windows of the family home in 1959 as his brother Harry and mother Alice look on. Tom followed Harry’s lead by joining Harworth and District Cycling Club. 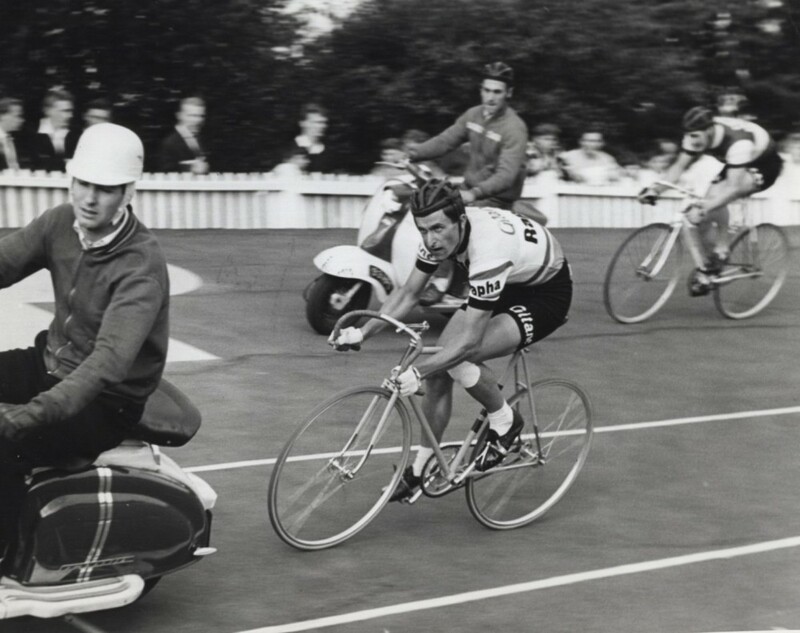 In the early days, Tom was often left behind in club races, but soon started winning club time trials, before moving to Rotherham’s Scala Wheelers. After his early rides on the road and in club time trials, Simpson moved to track cycling and became a pursuit specialist. He competed often at Herne Hill in London, as here in 1958. 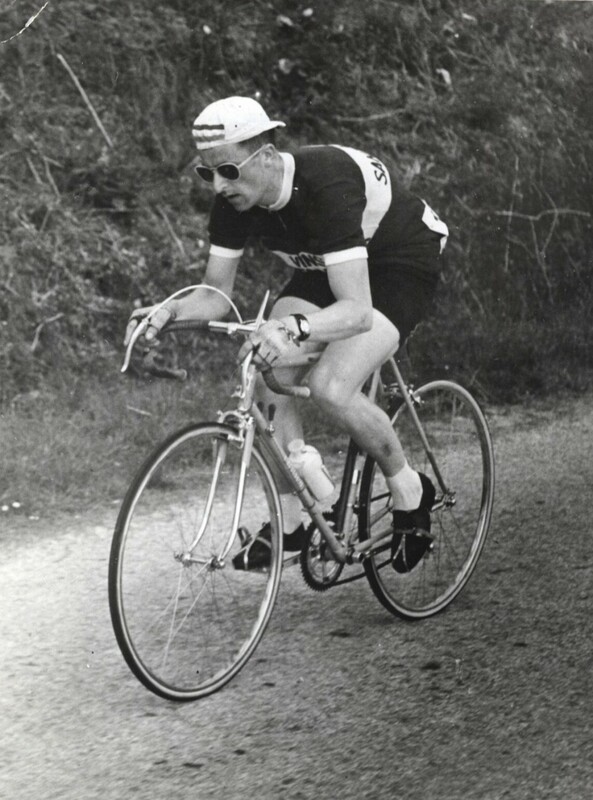 His career was now taking off, and Simpson was selected to ride the 1959 Road Race World Championships in the Netherlands. Looking relaxed and upbeat before the race, Simpson went on the finish fourth, with André Darrigade of France the winner. 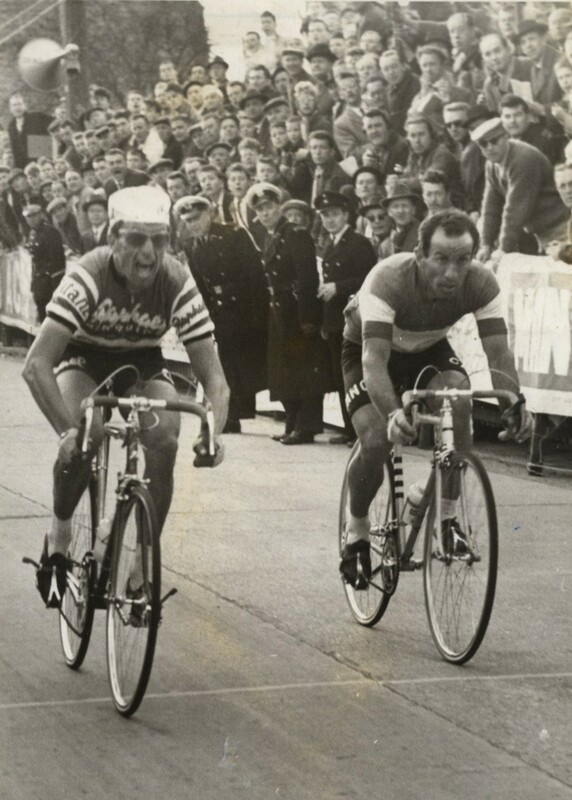 Backwards cap and sunglasses marked out the young British rider as he learned his craft in France, as above in 1959. Enjoying himself before a race again. 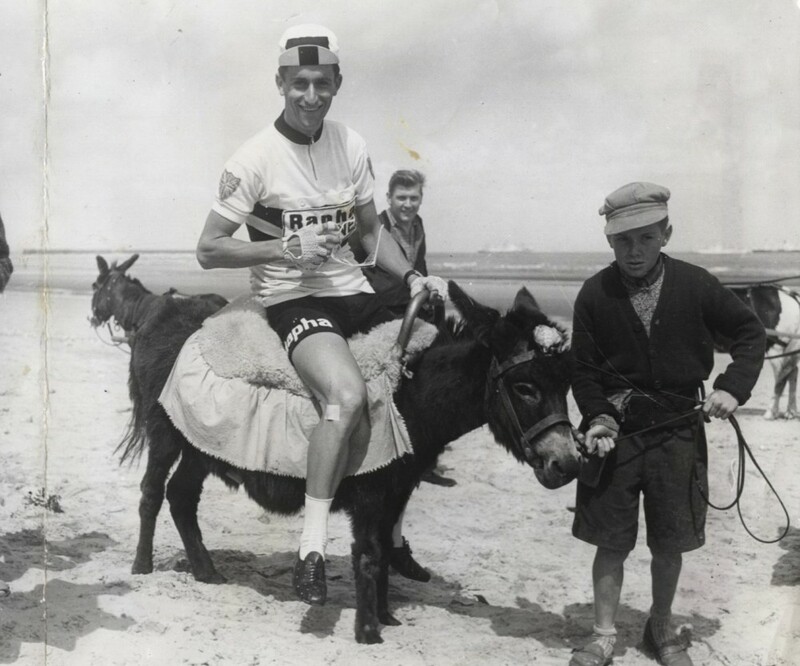 This time Simpson went for a donkey ride before the start of stage three of the Tour de France in 1960 at Malo-les-Bains. It’s a far cry from the strictly timed warm-ups and regimented mealtimes of the modern pro peloton. 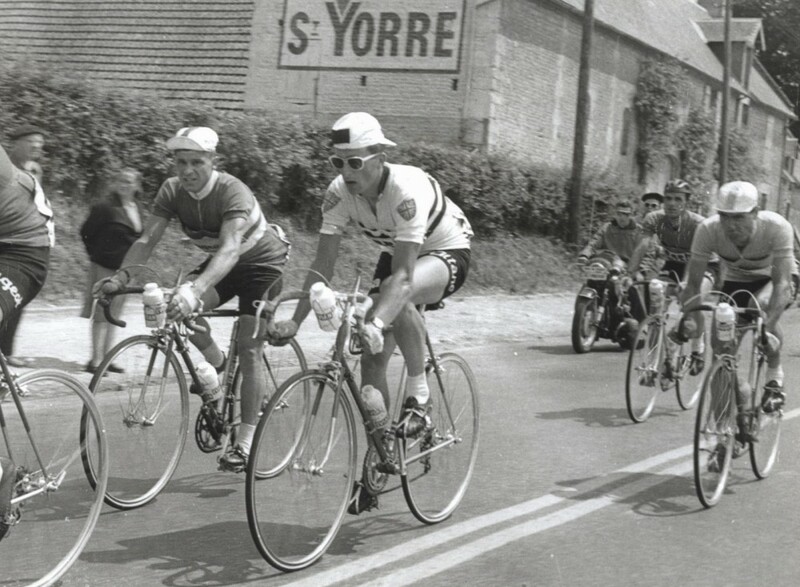 Trademark backwards cap and sunglasses make Simpson easy to spot in the peloton on stage nine of the 1960 Tour de France from St Malo to Lorient. He may have been distinctive from the beginning, but it would be another two years before he properly made his mark on the world’s biggest cycle race. 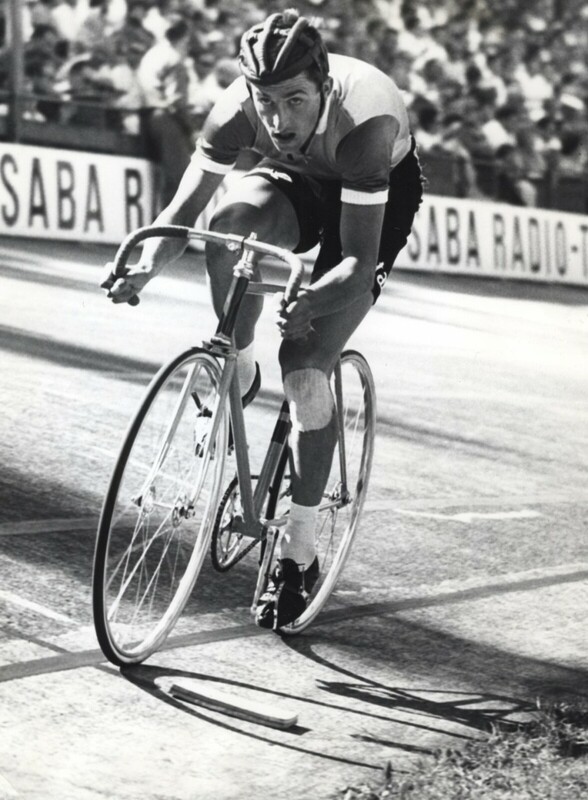 Back on the track, Simpson can be seen here winning his heat of the 500-metre pursuit at the 1961 World Track Championships in Zurich, Switzerland. He was eliminated in the quarter finals. 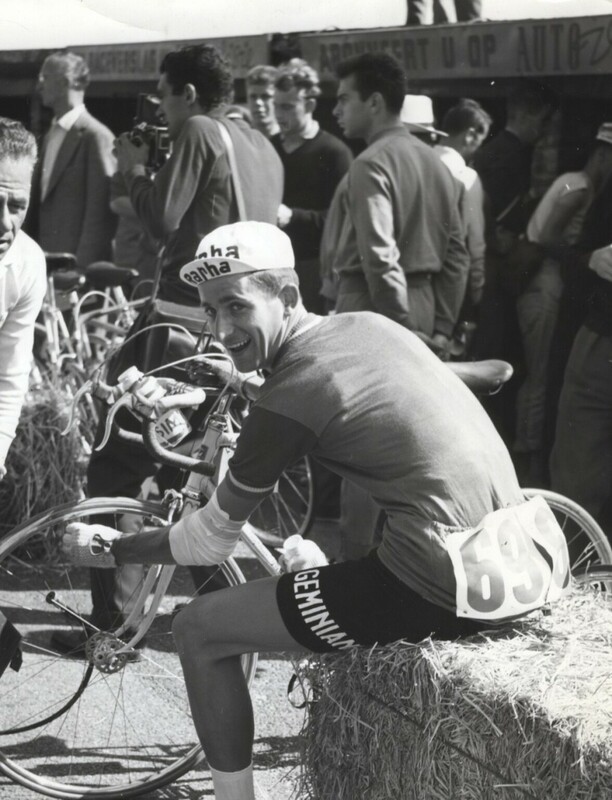 Simpson’s first major win as a pro came in the 1961 Tour of Flanders. He beat Nino Defilippis in a close sprint finish after some cat-and-mouse antics in the closing kilometres. 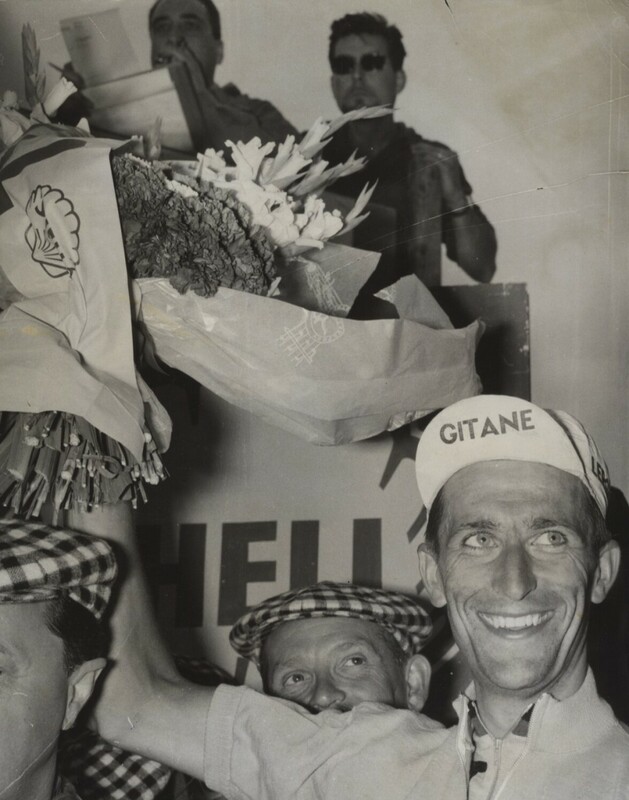 He equalled this one day result with wins in Milan-San Remo and Giro di Lombardia later in his career. 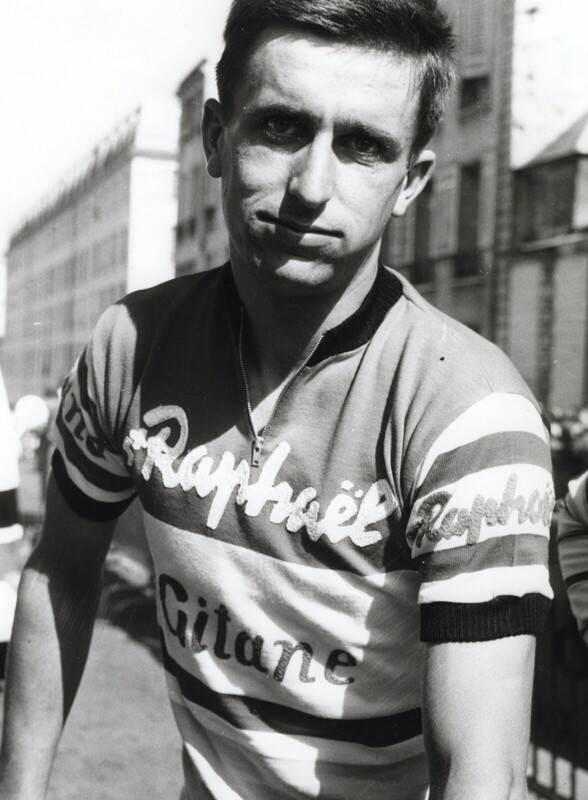 Continuing to ride for French teams, Simpson wore the jersey of Rapha-Gitane-Dunlop in 1960 and 1961. Here he heads to the start line of an early season race in 1961. 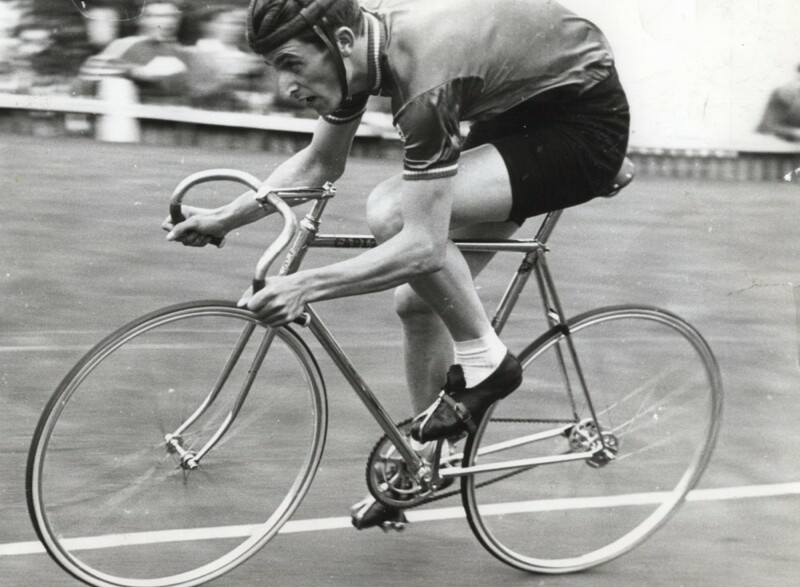 Swapping between the road and track throughout his career, Tommy returned to Herne Hill for the meeting of the champions in 1961. Above he can be seen motorpacing a Lambretta in one of the outdoor velodrome’s races. 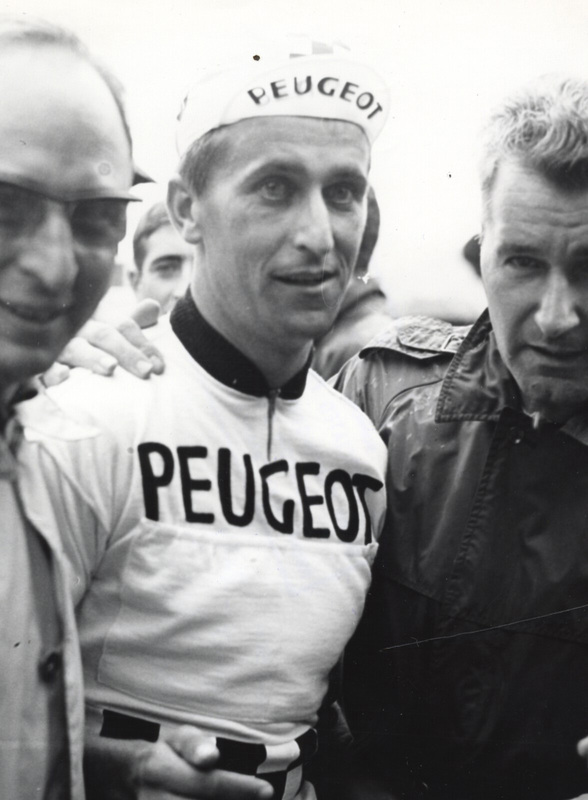 Making history: Tom Simpson became the first British rider to wear the yellow jersey at the Tour de France after stage 12 in 1962 from Pau to St Gaudens. Despite losing the jersey on the following day, Simpson will always be remembered for starting a club that now includes Chris Boardman (1994 – 3 days; 1997 – 1 day; 1998 – 2 days), Sean Yates (1994 – 1 day), David Millar (2000 – 3 days), Sir Bradley Wiggins (2012 – 13 days), Chris Froome (2013 – 13 days, 2015 – 15 days, 2016 – 13, 2017 – race in progress), Mark Cavendish (2016 – 1 day) and Geraint Thomas (2017 – 4 days). 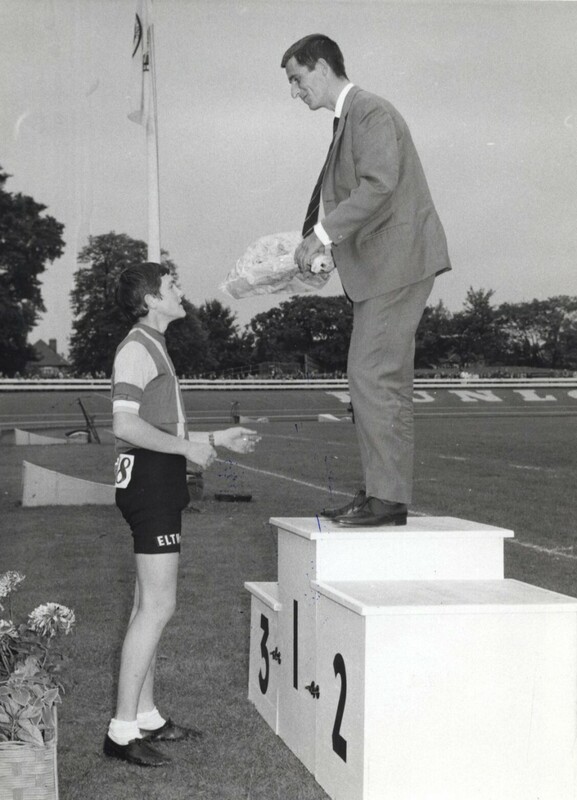 Joking with a young rider at Herne Hill in 1963. After increasing his palmarès with a win at Bordeaux-Paris in 1963, Simpson was bundled through the crowd to the presentation area. 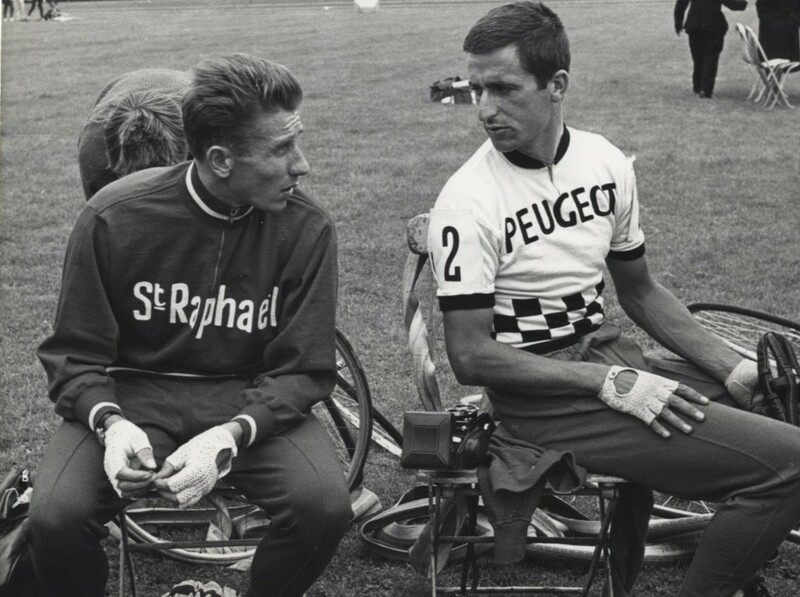 A meeting of greats: French legend and five time Tour de France winner Jacques Anquetil (left) sits and chats to Tom Simpson during a break from racing at Herne Hill on June 13, 1964. 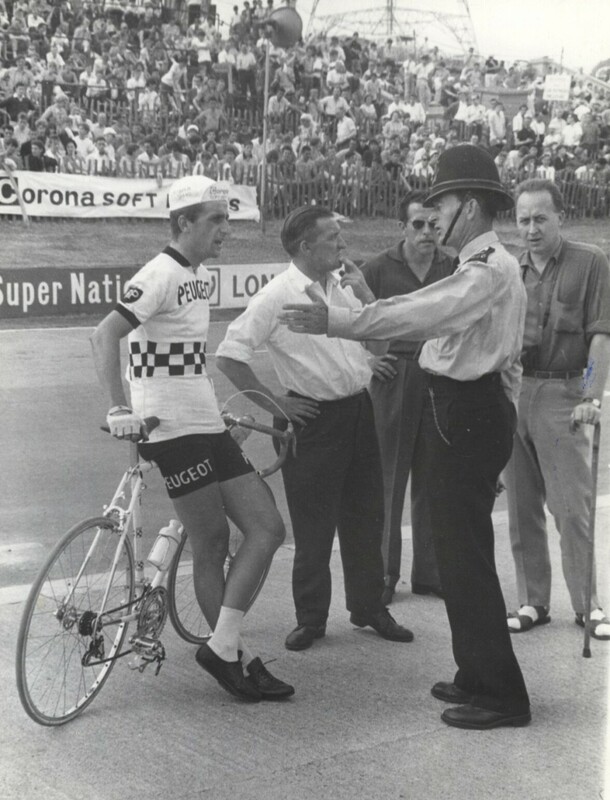 Not afraid to speak his mind, Simpson has words with a policeman at the Corona Grand Prix, Crystal Palace, 1964. Probably not the kind of image promoted by sportsmen in the 21 century, this photograph is a candid look behind the scenes of the Milan Six Day in 1965. Tom Simpson became the first British rider to win Paris-Nice in 1967, and was the only Brit to have done so until Bradley Wiggins’s victory in his golden season in 2012. It was later in the 1967 season that Tommy Simpson died. He collapsed on the ascent of Mont Ventoux during stage 13 of the Tour de France and could not be resuscitated. 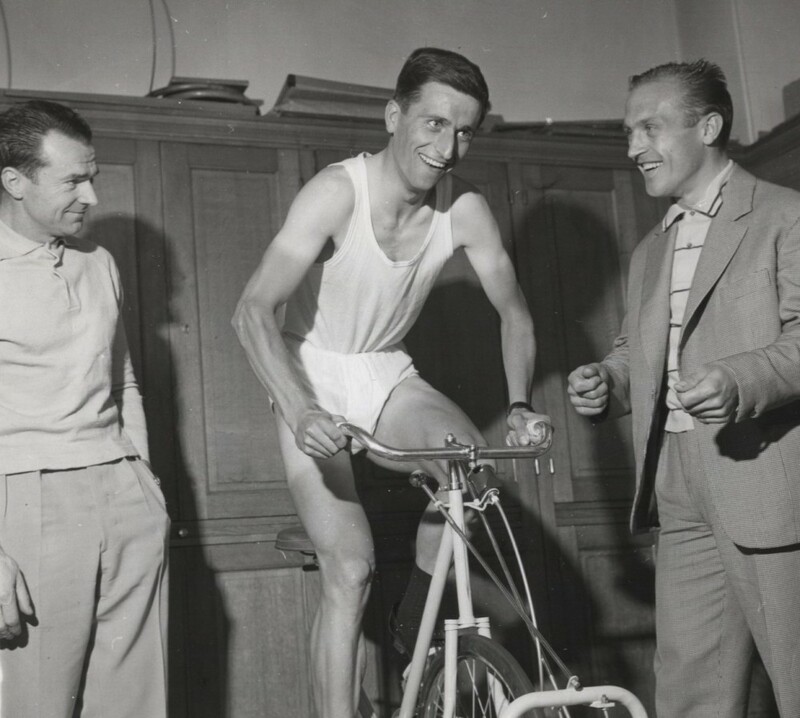 A post-mortem confirmed that Simpson had ingested amphetamines and alcohol, a mixture that proved to be fatal in conjunction with the high temperatures that day on Ventoux. He was just 29 years old. A memorial marks the spot where he fell.